Tall, jovial, and always wearing a welcoming smile on his face, Tony Khan, The Westin, Dhaka's newest recruit as Executive Chef, Culinary Kitchen, is a man of many talents. His versatile experience and adventures in the world of culinary art is manifold, making him a veritable master in his line of work. Khan began his training in Singapore before working in some of the most prestigious hotels and restaurants around the world. He later moved to Australia, his second home, where he spent thirty two years, learning and gathering experience from some of the most reputable institutions, such as the Melbourne School of Culinary Arts. Khan earlier worked for King Faisal, Saudi Arabia, and as Corporate Executive Chef for Marriott and Continental Hotels, was in charge of nine five-star Hotels in Pakistan, and later, on returning to Bangladesh, he joined Radisson Water Garden Hotel, Dhaka. Chef Tony is especially well known for his eclectic style of cuisine and in 1998 was one of the recipients of “10 Best Chefs in the World”, and in 1991 was awarded "Chef of The Year" by South Pacific Turism Board, Papua New Guinea. His exciting, dynamic repertoire includes French, Mediterranean, Modern Australian, Middle Eastern, Caribbean, African, Pacific Rim and Pan Asian cuisine. 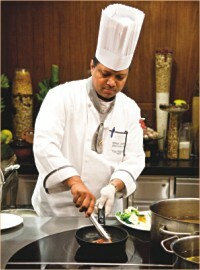 He has had a foot in practically all culinary camps from Singapore, Australia, France, Netherlands, USA, China, Pakistan, Bangladesh and Saudi Arabia. At The Westin, Dhaka, Chef Tony has already created a niche of his own, particularly in the Classical French Seafood arena, and some of the changes he's been making, are new delightful inclusions to the menus of all the restaurants, particularly Treats and Prego. Also, with his background in nutrition, Chef Tony strives to cater to every individual guest, by customising their meals according to their age and taste preferences, during their stay at the hotel. “I feel that every individual who tastes my food has a put a lot of trust on me, and that is a huge responsibility on my part.” Tony's philosophy is to provide a cuisine that is "practical, simple, and fresh, using quality seasonal produce." The exotic world of culinary art and fine dining hold many opportunities. Pioneering veterans, the likes of Chef Tony Khan and the magnanimous Atique Rahman, the new General Manager at the helm of The Westin, Dhaka, have paved the way to a whole new arena of lucrative prospects. Heat oil in a fry pan on medium. Cook chicken fillet for 5 minutes or until chicken is tender. Add garlic, tomato, and coriander with ½ cup of water. Simmer for 5 minutes, until tomato softens. Stir through and season to taste. Spoon tomato and vegetables mixture onto serving plate and top with chicken. Serve with steamed seasonal vegetables and baby potatoes. In a bowl, marinade fish with garlic and lemon juice. Heat oil in a fry pan on medium heat. Cook the fish until tender. Add vegetables, freshly ground pepper and sauté. Season to taste. Add coriander sprigs to garnish. Serve with steamed rice or noodles or pasta. Marinade the chicken with lemon juice, salt and pepper. Cook spaghetti and keep aside. Heat oil in a pan on medium. Add the chicken and cook until tender. Add the remaining ingredients and sauté until cooked through. Place cooked noodles on a serving dish, and pour sautéed chicken over the noodles just before serving.